she can quilt: Mod Pop - Ta Da! I am all done this huge Mod Pop! I had my tall teenagers stand on chairs and reach up to hold her today, as it was sort of clear and not at all cold. This king size quilt is 98" x 91", which is 8.2 feet tall by 7.6 feet wide. She is made from cottons in pink, orange and red, most but not all of them are Konas. The turquoise and royal blue chains are Essex linen. Julie from Distant Pickles designed this excellent pattern and it is available here. I quilted this quilt my self on my Janome Horizon - which has an extra wide harp for quilting. I free motioned a squareish stipple on the background red bits and I used my walking foot to echo the chains. I used a whole bunch of red/orange/pink and blue/turquoise variegated and plain threads - Aurafil, Superior Threads King Tut and Sulky. You can see the quilting on the back a bit better - for the back I used a king size grey sheet. That photo was taken before I washed her. I call this quilting "modern industrial" because it is not even close to perfect. The heavy quilt - there are a lot of seams - pulled the needle every time I stopped and although I tried hard to hold everything in place, the quilt shifted and pulled on the needle, often making little jogs, especially in the lines echoing the chains. But as I expected, you really don't notice that at all once the quilt is washed and dried. There she is on my king size bed. I made the binding out of left over bits of the reds, pinks and oranges. In the spirit of modern industrial, and because I could not bring my self to hand stitch about 41 feet, I machine stitched the binding down. I followed the excellent tutorials from my friend Marianne from The Quilting Edge here and here. I did have to redo a couple of the corners, but I am getting better at them. These last two photos are from before I washed this quilt. If you look you can see that there is a fair bit of drawing in from the wash and dry. I pre-washed all the fabrics, so that draw in is coming from the shrinkage in the cotton batting and the thread. The colours for this quilt were inspired to a large degree by the Andy Warhol portraits that use the turquoise and navy with aquas and blues. His images and colours are sort etched in my brain and they just felt like the right fit for this pattern. These colours are really hard to photograph, all I can say it that she is pretty bright in real life, sometimes I wonder if sunglasses are required. So, all I have to do is think up a name for her. My small Mod Pop was named Whitewater and you all helped me to find that name. Do you have some name ideas for me for this one? I started the Mod Pop QAL because I wanted to make a large size version of quilt and needed some friends to work along with me. I want to say a big thank you to everyone who has been quilting along with me. I don't know if I would have hung in there to finish this huge project without all the support from the group. There is another prize for everyone who finishes their Mod Pop quilts by February 17. However if you are going to be trailing along after, not to worry, I will keep the flickr group open and am happy to help anyone who needs it. Oh and this is my first finish for the the FAL, so I get to show off my other button again too. I hope you are all doing well on your finishes, I keep coming across them all over blogland. I have an update on sponsors coming soon for the FAL so stay tuned. I keep posting on the wrong days for the link ups I know but today is Fabric Tuesday at Quilt Story so I will link there and visit the others for inspiration. I hope you do too. Totally beautiful and amazing! Well done! Fantastic finish Leanne - I am so impressed that you quilted this monster of a quilt (and I mean that in size only) on your home machine. I can imagine that it was something of a workout! Anyway, it looks great - and is very much tempting me to do a Mod Pops quilt. I like really random names for my quilts, so my name suggestion is "Andy Warhol's Sunglasses". Be still my heart! Fabulous finish that's quite an accomplishment to quilt that yourself. BRAVO ! I love this quilt, the colors, the pattern, everything. You did an amazing job quilting it too. I was wondering for the quilting, did you pin baste or spray? I am working on a twin sized quilt right now and I am so worried about the puckers on the back I always seem to get. Also, I was wondering if you knew about how many inches your quilt wound up shrinking after you washed it. Thanks! This is one of my favorite pops. Congratulations on the finish. It looks fabulous! I'm going to suggest "Salt Water Taffy" because of the colors and the pattern. What an accomplishment, Leanne. It turned out just beautiful! Beautiful Leanne! Love how you've quilted it - and I love Adrianne's name suggestion. I love it, but am still amazed that you managed to quilt something that huge yourself. No name suggestions, sorry. It's a beautiful quilt Leanne, and I'm so impressed that you were able to quilt it at home. You must have the patience of a saint! I like the link to Andy Warhol in the name, but I don't know what! Great finish. I expect you are itching to work on something smaller now?! Fantastic finish Leanne. I'm amazed that you were able to quilt that on your machine. I like Adrianne's suggestion too or at least something with Andy Warhol in the name. What an achievement Leanne! It is such a wonderful design with your fresh take on the colours! And to think you quilted this all yourself! Andy Warhol's glasses are reminiscent of the shapes in this quilt so maybe call it "Andy's Glasses" or "Warhol's Spectacles"!? As for naming her, how about choosing something that is related to his studio "The Factory"? You could call it "1342 Lexington Avenue" as that was the address of the first Factory and it has a nice ring to it. It's a really amazing quilt I have enjoyed following it's progress. I think your quilting is amazing. I don't know that I would have the skill, or the patience, to do this myself. That is amazing - congratulations. You give me hope - I have just finished a quilt top 95" square and am feeling sick about how I might be able to quilt it - I have a Janome Horizon so now think that may be I can! What a fabulous modern and colourful quilt. A great finish. It turned out fabulous. That's a huge quilt to quilt on your machine. I'm pathetic when it comes to naming quilts...so no help here. Oh, Leanne, it's spectacular. Absolutely fab with all of the time you put into this - for the amazingly detailed quilting. Gorgeous. I stink at naming quilts...Liking Elisabeth's suggestion, though! It's superb! The colours and shapes remind me of a lava flow so perhaps something like 'Molten'? 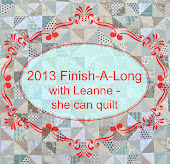 I can't tell you how much I love this quilt Leanne - the colours you chose are SO beautiful and work perfectly. Then there's the quilting, which may be industrial but it's urban industrial chic. Given how big it is, it's an incredible finish. Totally stunning, you rock so hard. Leanne that is so incredible!! I adore the colours and the quilting - it is stunning! If this was my mod pop, I would just be staring at it ALL DAY LONG. It is just so inspiring. The name that came to me right off was "fire and ice" but maybe you already have a quilt named that? Congrats again, Leanne. You started off the year with a mighty fine finish! You did so well with this quilt. It is beautiful and I love the vibrant colours you chose. I am glad you managed this enormos beast on the Horizon. Don't we love her ! It really is stunning Leanne, and you did such a brilliant job getting it quilted. I had a nosy close up of the back, and wow, that quilting is superb. Really wonderful work! Congrats on a great finish! Excellent job all around! Leanne, everytime I see this quilt I fall in love with it again! And I am always reminded of an "hourglass" when I see it - name idea, maybe? Or "beakers" maybe? Great job and I esp. love your quilting - it's perfect. I don't know where to begin Leanne, it is wonderful!! The quilting is amazing, and the fact it is so gigantic makes it even more extraordinary. Great pattern in that quilt. I tend to like bold colors and I like the ones you used. Stunning quilt - love your inspiration for the colours! You are amazing Leanne, the quilting is superb! What a huge achievement, quilting a king size on a domestic machine, not to mention sewing all of those curves in the first place! I find the colours very candy-like so I might simply call her Lolli-Pop. Oh Lolli-Pop, that's a good one! I was going to suggest Citrus Pop. It's a fabulous, fabulous finish, Leanne!! Its fabulous.The name that sprang to mind is 'quilted a blue streak' even tho' its not! Dont know why that came to mind - I have a strange mind! I'm so impressed that you quilted this at home. I definitely feel inspired to quilt my queen sized quilts at home :-D Congrats on your quilt! You know I am so impressed by everything about this quilt, the colors, the SIZE, all the machine binding (I have trouble with the corners, too) and the machine quilting. I wish I could think of a name, but I am having the same trouble with my HST BOM quilt. I have admired the colors of this quilt since you first posted photos. They aren't colors I would have chosen, but after seeing them all come together fabulously in your quilt, I would now. I'm glad you are using this quilt for yourself! It should make your room cheery during the winter. What a corker! You must have arms of steel to have quilted this, well done!